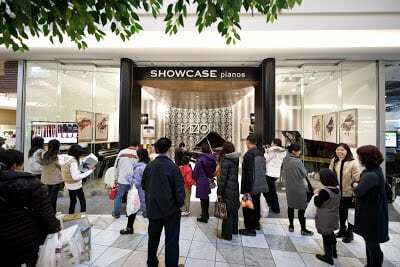 Richmond, BC – On Friday the 25th of December, Vancouver’s Showcase Pianos opened a 2nd location in Richmond’s beautiful Aberdeen Mall. Sixteen year old concert pianist Tim Zhang who now studies in New York was on his way through Vancouver to perform a series of concerts in China. Zhang was asked to perform for this special occasion. Fairchild TV News came to interview Tim Zhang and film him playing a few notes on the unique avant-garde half-million-dollar Fazioli ‘M. Liminal’ piano that is on display in the new store. The ‘M. Liminal’ Fazioli was designed by world renowned architect Philippe Gendre of NYT Line in France. It was estimated that in excess of 2,000 people visited or saw the new store on the first day alone. This ‘M. Liminal’ Fazioli is the actual piano that will be seen on screen at the side of Pierce Brosnan and Uma Thurman in FOX’s new $200-million production of the movie ‘Percy Jackson’ in February. So far only eight ‘M. Liminal’ Fazioli pianos exist in the world – and one of them sits in the lobby of the new Mandarin Oriental in Taipei. Beautiful second store, Manuel! Many Congratulations!